A city of Turkey in Europe with a population of 70,000, of whom about 8,000 are Jews. The first trace of a Jewish settlement in this city (according to a somewhat doubtful source found in E. Deinard's "Massa Krim" (Burden of the Crimea), p. 13, Warsaw, 1878) was during the reign of Theodosius I. in the year 389. Here they dwelt for a long time, suffering the oppression of the Byzantine emperors, chiefly inaugurated by the codes of Theodosius II. (438) and of Justinian I. (527-565), which not only prohibited them from celebrating the festival of the Passover before the Christian Easter, but compelled them also to make use of the Greek and Latin translations of the Holy Scriptures in their Sabbath readings. Both Benjamin of Tudela (about 1171) and Judah Al-Ḥarizi (about 1225) visited Constantinople, but neither of them makes any mention of the Jews of Adrianople. There isno doubt that such a colony existed about this time, for family names such as Callo, Policar, Papo, Pilosophe, Hoursi, Zaffira, and even common names such as pappou (grandfather), mana (mother), papas (priest), trandafila (rose), skoularitza (earring), etc.—plainly of Greek origin—are prevalent to this day. Moreover, there exists also a synagogue of the "Gregos," or Greek-speaking Jews, having a special ritual, concerning which there is the following legend of Byzantine times: The sexton of a neighboring church noticed that after the ceremony of the habdalah, formerly held in the synagogue itself, the wine-filled chalice used in the service was secreted in a closet. He, therefore, clandestinely entered the synagogue and substituted blood for the wine; then he hastened to inform the judge of the blood-filled chalice and to accuse the Jews of ritual murder. During the same night the beadle of the synagogue had a dream in which the scheme was revealed to him, and he hurried to refill the chalice with wine—thus enabling the Jews to establish their innocence. The rich Jews of Adrianople and other cities of the interior, wearied with the exactions of the governors of the province and the zealous proselyting of the priests of the Greek Orthodox Church, removed to the cities of the coast, where they could live in comparative quiet and greater comfort and security. In 1361, when Amurath I. captured Adrianople, he found there only a small and impoverished Hebrew community, which hailed as their savior a conqueror whose religion so nearly resembled their own. They appealed to their coreligionists of Brusa to come and settle in the new Ottoman capital and teach them the language of their new masters. The rabbi—who had been invested by the sultan with administrative and judicial powers over the communities of Rumelia—established in Adrianople a rabbinical college, to the faculty of which all religious questions were referred by the Jews of Buda, Jassy, Galatz, and elsewhere. This college also received students from Russia, Poland, and Hungary. A group of Jews, expelled from Hungary in 1376 by Louis I., took refuge there under the protection of the Crescent. To this Hungarian influx the Synagogue Budoun (of Buda) owes its existence, and this name, like the family name "Magyar" still existing, shows the origin of the congregation. The Hebrew soldiers who began to serve in the Turkish army from the beginning of the Ottoman empire were enrolled in the ghuraba (non-Mussulmans, or strangers) organized by Amurath II. (1421-51). As a community, the Jews took no part in the riots of the dervishes under Mohammed I. 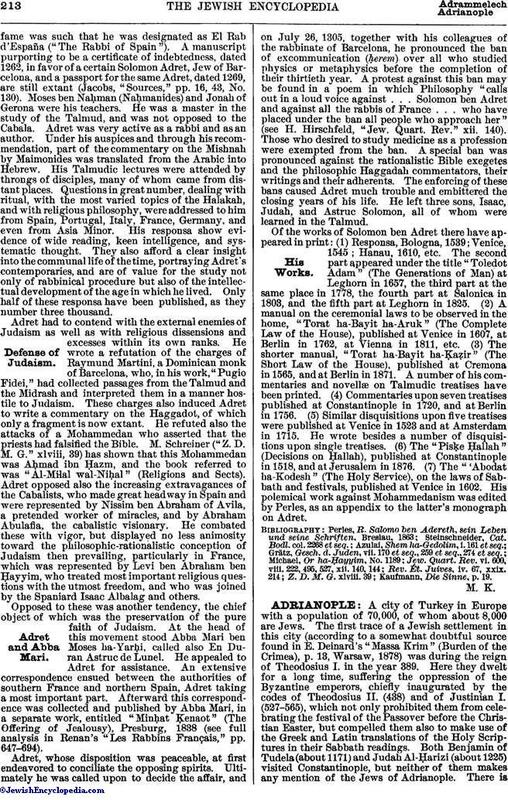 (1413-21) fomented by Bedreddin, a resident of Adrianople, who used as his tool Torlak-Kiamal, a converted Jew. The Jews of Adrianople have always remained loyal to the sultans, and many of them have become distinguished scientists, so that Mohammed II. (1453) even made a Jew, Hakim Ya'aḲub, his physician, and afterward appointed him minister of finance (defterdar). The Karaitic community of Adrianople, one of whose members, Judah b. Elijah (1363-90); removed to the Crimea (see Deinard, "Massa Krim," p. 66), throve and, by additions from the Crimea and the south of Poland, greatly increased in numbers. Through the teachings of the rabbis and constant contact with the rabbinical Jews and their professors, such as Ḥanok Sasporta of Catalonia, and more especially the tolerant Mordecai b. Eliezer Comtino (1460-90), an astronomer, mathematician, and logician, the community was aroused from its spiritual lethargy. Spurred on by its leading men, Menahem Bashyatzi and his sons Moses, Menahem Maroli, Michael the Elder, and Michael's son Joseph, this Karaitic band instituted a reform in their ritual which permitted the use of a lighted lamp on Friday evenings and a fire on the Sabbath—a reform which triumphed over all the objections of the conservatives. After the conquest of Constantinople in 1453, the members of this sect migrated in a body to that city, leaving behind them no other traces of their former presence than the epitaph on a tombstone of a certain Moses Yerushalmi, ("of the Karaites"), in the Rabbinite cemetery, dated Tuesday, 9th of Ḥeshwan, 5463 (1702). The Rabbinite community, on the contrary, remained at Adrianople and increased in numbers and in influence. Groaning under the burden of persecutions and being attracted by the glowing accounts of the kindness of the sultans and the liberties and favors which the Jews enjoyed in Turkey—graphically described in letters from Isaac Ẓarfati in 1454—the Ashkenazim flocked to Adrianople from Bavaria, Swabia, Bohemia, Silesia, and elsewhere, and there founded an Ashkenazic synagogue. Traces of the presence of German Jews appear in certain words of Judæo-German origin, like roubissa (rabbi's wife, ), boulissa (housekeeper, landlady, ), and in family names like Ashkenazi, as well as in ritualistic usages. The only actual proof, however, is to be found in the epitaph of Moses Levi Ashkenazi Nasi (Prince) ben Eliakim (1466 or 1496). These settlers, together with a contingent which came a little later from Italy and founded the three synagogues of Italy, Apulia, and Sicily, joined forces with the Jews banished from Spain in 1492, who founded seven other synagogues under the names of Aragon, Catalonia, Evora, Gerush ("Exiled"), Majorca, Portugal, and Toledo. This increased the number of synagogues to thirteen. 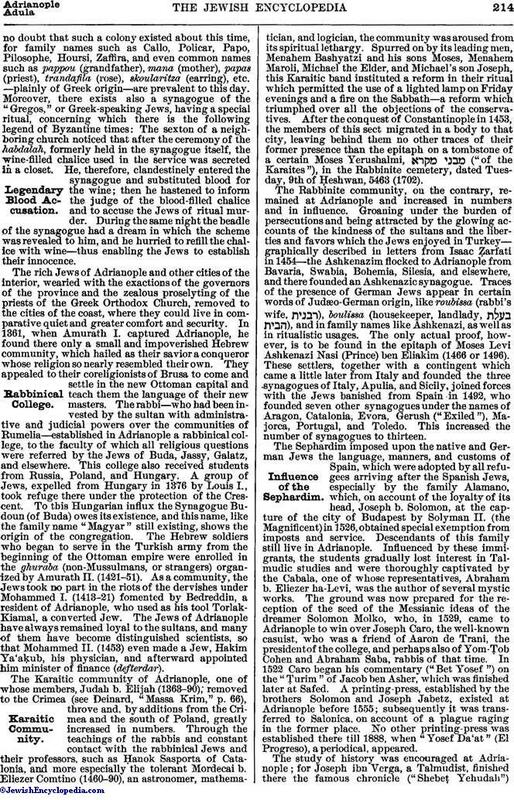 The Sephardim imposed upon the native and German Jews the language, manners, and customs of Spain, which were adopted by all refugees arriving after the Spanish Jews, especially by the family Alamano, which, on account of the loyalty of its head, Joseph b. Solomon, at the capture of the city of Budapest by Solyman II. (the Magnificent) in 1526, obtained special exemption from imposts and service. Descendants of this family still live in Adrianople. Influenced by these immigrants, the students gradually lost interest in Talmudic studies and were thoroughly captivated by the Cabala, one of whose representatives, Abraham b. Eliezer ha-Levi, was the author of several mystic works. The ground was now prepared for the reception of the seed of the Messianic ideas of the dreamer Solomon Molko, who, in 1529, came to Adrianople to win over Joseph Caro, the well-known casuist, who was a friend of Aaron de Trani, the president of the college, and perhaps also of Yom-Ṭob Cohen and Abraham Saba, rabbis of that time. In 1522 Caro began his commentary ("Bet Yosef") on the "Ṭurim" of Jacob ben Asher, which was finished later at Safed. A printing-press, established by the brothers Solomon and Joseph Jabetz, existed at Adrianople before 1555; subsequently it was transferred to Salonica, on account of a plague raging in the former place. No other printing-press was established there till 1888, when "Yosef Da'at" (El Progreso), a periodical, appeared. The study of history was encouraged at Adrianople; for Joseph ibn Verga, a Talmudist, finished there the famous chronicle ("Shebeṭ Yehudah")begun by his grandfather, Judah, and continued by his father, Solomon. This was a timely work, for the autos-da-fé which it recorded were renewed in Ancona, in 1556, and aroused the indignation of the Jews in Turkey, including those of Adrianople, who, in order to take revenge on Pope Paul IV., thought of adopting Joseph Nasi's suggestion to cease shipping their merchandise to the port of Ancona and to transfer their commerce to Pesaro. Neither Joseph Ẓarfati, author of sermons ("Yad Yosef," 1617), nor Judah Bithon (1568-1639) witnessed the Messianic agitation instigated by Shabbethai Ẓebi, which came to an end at Adrianople, when both Ẓebi and his wife embraced Islam (Sept. 21, 1666) in the presence of Sultan Mohammed IV., of which fact legends are rife to this day. 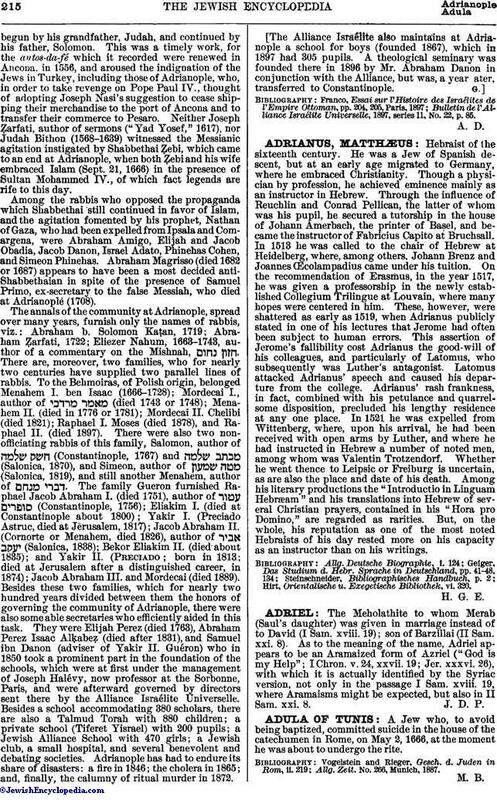 Among the rabbis who opposed the propaganda which Shabbethai still continued in favor of Islam, and the agitation fomented by his prophet, Nathan of Gaza, who had been expelled from Ipsala and Comargena, were Abraham Amigo, Elijah and Jacob Obadia, Jacob Danon, Israel Adato, Phinehas Cohen, and Simeon Phinehas. Abraham Magrisso (died 1682 or 1687) appears to have been a most decided anti-Shabbethaian in spite of the presence of Samuel Primo, ex-secretary to the false Messiah, who died at Adrianoplė (1708). The annals of the community at Adrianople, spread over many years, furnish only the names of rabbis, viz. : Abraham b. Solomon Kaṭan, 1719; Abraham Ẓarfati, 1722; Eliezer Nahum, 1663-1743, author of a commentary on the Mishnah, . There are, moreover, two families, who for nearly two centuries have supplied two parallel lines of rabbis. To the Behmoiras, of Polish origin, belonged Menahem I. ben Isaac (1666-1728); Mordecai I., author of (died 1743 or 1748); Menahem II. (died in 1776 or 1781); Mordecai II. Chelibi (died 1821); Raphael I. Moses (died 1878), and Raphael II. (died 1897). There were also two non-officiating rabbis of this family, Salomon, author of (Constantinople, 1767) and (Salonica, 1870), and Simeon, author of (Salonica, 1819), and still another Menahem, author of . The family Gueron furnished Raphael Jacob Abraham I. (died 1751), author of (Constantinople, 1756); Eliakim I. (died at Constantinople about 1800); Yakir I. (Preciado Astruc, died at Jerusalem, 1817); Jacob Abraham II. (Cornorte or Menahem, died 1826), author of (Salonica, 1838); Bekor Eliakim II. (died about 1835); and Yakir II. (Preciado; born in 1813; died at Jerusalem after a distinguished career, in 1874); Jacob Abraham III. and Mordecai (died 1889). Besides these two families, which for nearly two hundred years divided between them the honors of governing the community of Adrianople, there were also some able secretaries who efficiently aided in this task. They were Elijah Perez (died 1763), Abraham Perez Isaac Alḳabeẓ (died after 1831), and Samuel ibn Danon (adviser of Yakir II. Guéron) who in 1850 took a prominent part in the foundation of the schools, which were at first under the management of Joseph Halévy, now professor at the Sorbonne, Paris, and were afterward governed by directors sent there by the Alliance Israélite Universelle. Besides a school accommodating 380 scholars, there are also a Talmud Torah with 880 children; a private school (Tiferet Yisrael) with 200 pupils; a Jewish Alliance School with 470 girls; a Jewish club, a small hospital, and several benevolent and debating societies. Adrianople has had to endure its share of disasters: a fire in 1846; the cholera in 1865; and, finally, the calumny of ritual murder in 1872. The Alliance Israélite also maintains at Adrianople a school for boys (founded 1867), which in 1897 had 305 pupils. A theological seminary was founded there in 1896 by Mr. Abraham Danon in conjunction with the Alliance, but was, a year ater, transferred to Constantinople. Bulletin de l'Alliance Israélite Universelle, 1897, series 11, No. 22, p. 85.